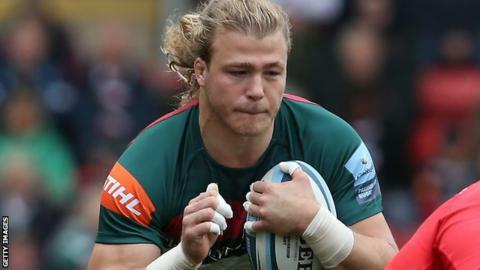 Leicester Tigers' Scotland back row David Denton will not play again this season as he recovers from concussion. The 29-year-old has not played since 6 October when he was hurt in the 23-15 Premiership win over Northampton. "Ultimately, the decision was taken out of his hands by experts," said Leicester head coach Geordan Murphy. "He's disappointed to not be out there with the lads but understands the importance of the situation and his long-term health." Denton, a summer signing from Worcester, had started all six of Leicester's matches before his injury in the match at Twickenham. "It has been a difficult season and one I wish I could have played a bigger role in alongside the rest of the squad," added Denton to the club website.